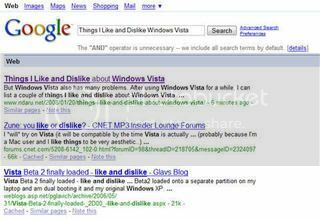 Windows Vista is a vast improvement over Windows XP, in terms of visual appeal, user interface and security. But Windows Vista also has many problems. 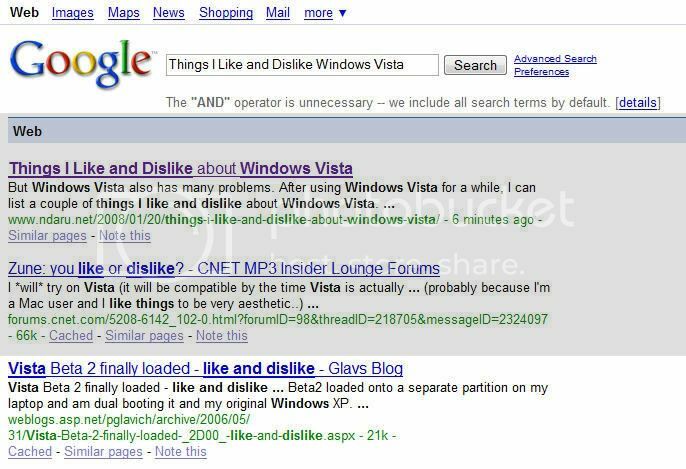 After using Windows Vista for a while, I can list a couple of things I like and dislike about Windows Vista. 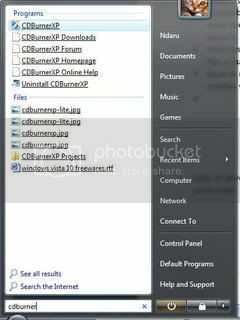 1) Better user interface on Windows Vista’s Explorer. New buttons bring formerly obscure features to the front. 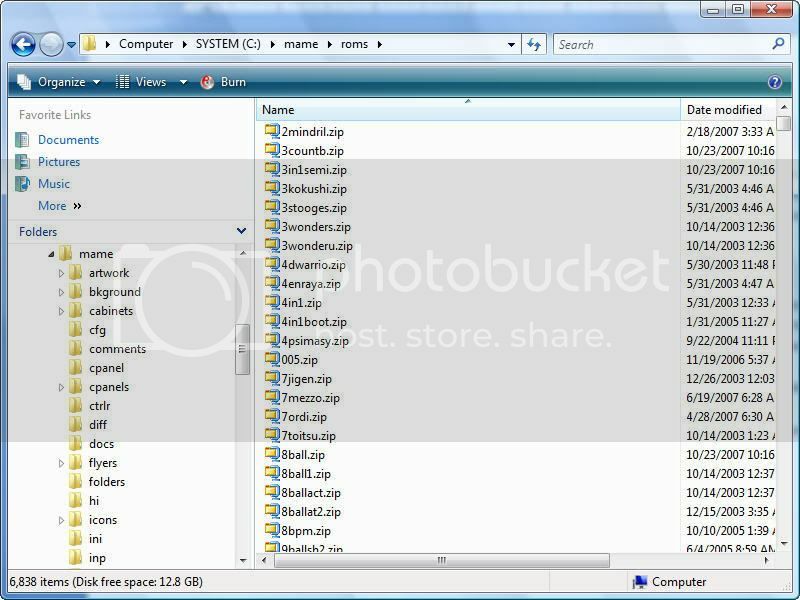 Much easier and integrated Search feature (no more need for Ctrl+F), new view types (Large Icons and Extra Large Icons) for image browsing and easier to navigate Address bar. The new integrated Search feature inside Explorer. 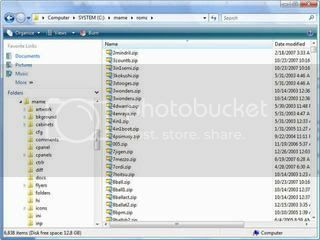 2) Much faster directory display on Windows Explorer, especially on directories with more than 5,000 files or subdirectories. 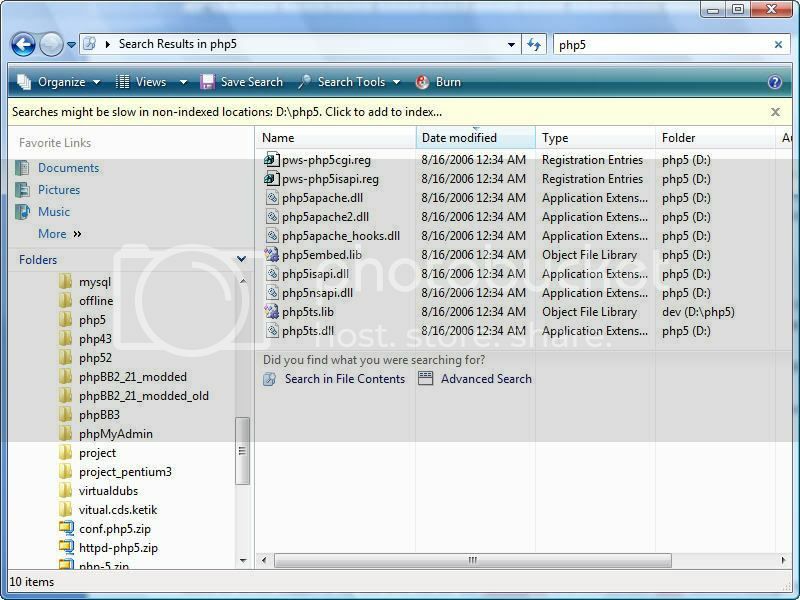 Try to display a directory with 6,838 files on Windows XP 32 bit. Displaying 6,838 files takes no time. 3) Easier to navigate Start Menu, thanks to the integrated Search feature. Extremely handy if you have installed way too many applications. Easier to navigate Start Menu, thanks to the integrated Search feature. 1) Lack of driver supports. The first time I installed Windows Vista, I had no sound! The printer driver doesn’t work. Nor does the drivers for my Bluetooth dongle, Phillips Pinnacle PCTV Stereo and dirt-cheap Chinese-made webcam. Luckily the driver for my USB ADSL modem works. Otherwise I won’t be able to connect to the internet. The audio problem has also been solved, thanks to the latest update from Microsoft. I still can’t print, though. 2) Lack of software compatibilities. Software that runs just fine on Windows XP, doesn’t run at all on Windows Vista. I have an application that actually crashes Windows Vista and forces me to restart in Safe Mode to uninstall it. This has led me to search for Vista-ready updates, and if there is none I have to replace it with other Vista-ready applications. 3) Extremely cautious dialogs. Window Vista doesn’t trust me and need to remind me for almost every action I am about to take. Thankfully the default response can be set to be less extreme. Conclusion: I like Windows Vista, but I also need my PC for work and I need to use all the devices inside. Its lack of driver supports doesn’t bide well for this. Perhaps I should reconsider Windows XP? Update: Google lists this page in 6 minutes. Wow! Well, where’s you adsense code man ? Hmm… I like to keep it clean for this moment (read: too few visitors anyway). I’ve never tried vista, but I tried Vista Transformation Pack for some time. I don’t particularly enjoy the windows explorer. I had to press the TAB (and Shift-TAB) button a lot more to navigate through out explorer pane. It’s quite troublesome since I use keyboard a lot often than mouse. That goes also on the start menu. Ever since I use XP, I always use the classic start menu. The improved start menu turns out to be a clutter for me. For the Start Menu, I use this: [Ctrl+Esc] and type the application name. Real quick and easy, especially if you have installed way too many applications.